(Nanowerk News) A new photostable fluorescent dye for super resolution microscopy could serve as a powerful tool to visualize biological events and structural details in living cells at real-time for prolonged recording periods. Bioimaging by fluorescence microscopy is a useful technique to study the localization and movement of molecules in living cells by fluorescence. Yet, the gradual degradation of fluorescent dyes when exposed to the high intensity light necessary for super resolution microscopy has been a major obstacle for long-term observations. In a new study, published online in the journal Angewandte Chemie International Edition ("A Phosphole Oxide Based Fluorescent Dye with Exceptional Resistance to Photobleaching: A Practical Tool for Continuous Imaging in STED Microscopy"), a team of chemists and biologists at the Institute of Transformative Bio-Molecules (ITbM), Nagoya University has developed a new fluorescent dye, "C-Naphox" with enhanced photostability to enable continuous live cell imaging by STED microscopy, which opens doors to observe real-time biological events for extended time periods with high resolution. Advances in super-resolution techniques such as stimulated emission depletion (STED) microscopy (2014 Nobel Prize in Chemistry) have enabled nanoscale visualization of biological systems. STED microscopy allows up to ten times higher resolution in living cells with respect to conventional microscopes by employing a fluorescence excitation beam in combination with a surrounding doughnut-shaped STED beam. While the molecules at the center are excited to a higher energy state and fluoresce, the molecules exposed to the STED beam are confined to the ground energy state. As fluorescence is detected at the point that is not exposed to the STED beam, this makes it possible to detect objects that are only tens of nanometers apart. The resolution of conventional optical microscopy has been limited to half the wavelength of light i.e. ~200 nm, according to the law stated by Ernest Abbe in the 19th century. This is because the diffraction of light blurs objects that are separated less than 200 nm apart into one image. Since cell organelles, viruses, DNA and proteins that are of interest to life scientists are usually less than 200 nm, STED microscopy overcomes the limitation of light diffraction and enables the visualization of such small structures in high resolution. Nonetheless, the light intensity required for super-resolution fluorescence microscopy is much higher than conventional microscopy, which leads to photodegradation of fluorescent dye molecules. As the spatial resolution of STED imaging correlates with an increase in STED light intensity, photodegradation of fluorescent dyes becomes a serious issue. Representative photoresistant fluorescent dyes such as Alexa Fluor® 488 and ATTO 488 are also known to encounter photodegradation in STED microscopy, making it difficult to conduct continuous live-imaging of biological systems while retaining high resolution. 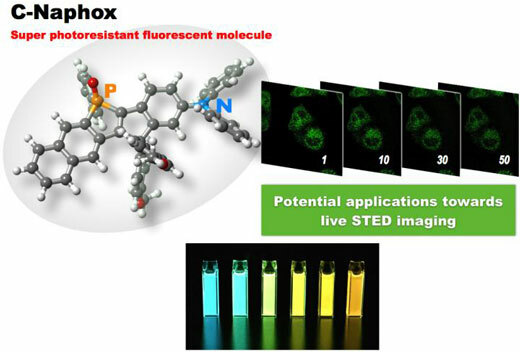 To overcome this issue of reduced resolution in STED imaging due to photodegradation, ITbM's team led by Principal Investigators Shigehiro Yamaguchi, a synthetic chemist and Tetsuya Higashiyama, a plant biologist have developed a new fluorescent dye, C-Naphox that has enhanced photostability relative to conventional dyes. C-Naphox has demonstrated to be extremely photoresistant with almost no degradation of fluorescence even after prolonged STED imaging in live cells. C-Naphox (diarylmethylene-bridged naphthophosphole P-oxide) consists of an aromatic framework with an amino moiety incorporated for its electron-donating properties and phosphorus oxide for its electron-accepting properties, leading to intense fluorescence emissions. "Although the previously synthesized molecules in the Yamaguchi group have also led to high fluorescence intensity, it is the carbon-bridged structure in C-Naphox that is the key to its extremely high resistance to high intensity light," says Aiko Fukazawa, an associate professor in Yamaguchi's group. "I have been working on the synthesis of molecular frameworks containing specific elements since 2006, but it was since the start of ITbM in 2013 that we really started to focus on synthesizing molecules as fluorescent probes for live cell imaging," she continues. Together with Masayasu Taki, an associate professor and Chenguang Wang, a postdoctoral research fellow in Yamaguchi's group, they optimized the structure of the fluorescent dye for live cell imaging. "C-Naphox and other derivatives were rapidly synthesized by Dr. Wang in less than ten steps and were found to be air-stable for months at room temperature," says Fukazawa. "Furthermore, C-Naphox exhibited no significant toxicity towards cells at micromolar concentrations that are usually required for cell staining." The photostability of the newly synthesized dye was proven by irradiation experiments with a xenon lamp. The relative absorbance of C-Naphox was compared to that of representative commercially available STED imaging fluorescent probes, Alexa Fluor® 488 and ATTO 488. The results of the experiments showed that over 99% of C-Naphox remained intact even after 12 hours of irradiation, whereas only 26% of Alexa Fluor® 488 remained present after 2 hours. Although 97% of ATTO 488 persisted after 2 hours of irradiation, the amount present was reduced to 59% after 12 hours. HeLa cells were then stained by either C-Naphox or Alexa Fluor® 488 and exposed to repeated STED imaging conditions. Although Alexa Fluor® 488-stained cells showed a decrease in fluorescence signal intensity after 5 recordings, the intensity of C-Naphox remained virtually unchanged under the same conditions. "We were really pleased to see that C-Naphox showed exceptionally high photostability over a relatively long time period," says Fukazawa and Taki. "The best moment of this work was when we saw that the fluorescence of C-Naphox in HeLa cells persisted and remained unchanged even after recording 50 images under STED conditions." Live-cell images were taken by Yoshikatsu Sato, the chief coordinator at the Live Imaging Center of ITbM. "As STED microscopy is an extremely powerful tool to visualize extremely small structures, we hope to apply these types of photoresistant molecules to study biological events such as the formation of actin filaments in cells," says Taki. "C-Naphox is an extremely photoresistant fluorescent dye that allows repeated STED imaging that has been difficult with conventional dyes. We are currently conducting further optimization studies in order to improve the practicality of C-Naphox as a useful fluorescent probe in continuous time lapse live cell STED imaging and multi-color imaging," says Fukazawa. "Our work consists of designing molecules that contain elements such as boron, phosphorus, silicon and sulfur in the usual molecular framework of carbon, nitrogen and oxygen. We are extremely pleased to see our molecules developing into tools that are useful for biological studies and hope to continue to work with biologists to discover new molecules and high resolution techniques to understand biological phenomena in living systems," says Yamaguchi.